Wanted: A More Intelligent Green Design! 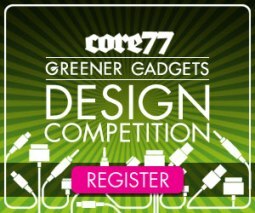 Green Gadgets and Core77 invites all to generate outstanding design innovations for greener electronics. Designers are invited to explore the concept of “Greener Gadgets” to create the greenest blueprint solving issues behind energy, carbon footprint, health and toxicity, product lifestyle or social development. Challenge: All you need to do is – Make a short (maximum 200 words) description of project separately and include text in the composition of images. Designs should seek to minimize the environmental impact of consumer electronic devices at any stage in the product lifecycle. Designers can focus on a particular area of human enterprise (learning, playing, communicating, etc. ), or a particular context (work, home, school, etc. ), a particular material, or a specific device. Areas of sustainability to consider include energy, materials/ lifecycle/ recycling, social impact, and educational development. Once they receive your idea, they will send you an action plan and help you plan your project well. Then present your project to a panel of mentors to receive feedback and advice. Once approved, you will receive your grant, and you are then ready to launch your environmental venture. Do it! The top 50 entries will be published on the web for voting and commenting, and top finalists will be showcased live at the Greener Gadgets Conference in New York City on February 27th for judging by an expert panel. The Grand Prize for this year’s competition is US$ 3,000, with Second and Third Prizes of US$ 1,000 each.